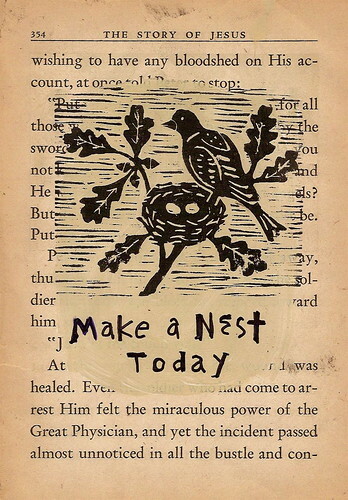 make a nest today, originally uploaded by bbmarie. "In one creative thought a thousand forgotten nights of love revive, filling it with sublimity and exaltation. And those who come together in the night and are entwined in rocking delight do an earnest work and gather sweetnesses, gather depth and strength for the song of some coming poet, who will arise to speak of ecstasies beyond telling." I live from one creative thought to another like a string of uncultured pearls. This string keeps threatening to break and spill my loveliness all over the ground which would be OK because then they would sink into the soil and sprout more poems and creative ideas. This Thursday evening, the 16th of April, begins a great journey. It will be the first of four consecutive Thursday night Wood Cut Workshop sessions in my studio with six people from the community who will be more than students. They will be travelers join together for a great adventure. They will be poet gardeners who will plant with in themselves the seeds of fresh creative ideas. As they enter into the ancient medium of wood cut printing they will uncover new things within themselves. It will be like discovering a room in the house you have lived in for years that you somehow never even new was there. In fact this room is not empty but full of forgotten and long unused l treasures tarnished and covered with dust that only need a good shine and shaking out to come back into use. Spring is the time for planting, new growth, stretching out and beginning new things. Come and join us!